The site’s popularity can likely be attributed to Cathe’s original repurposing ideas; clear, user friendly how-to’s; get-it-now-style freebies; inherent sass and pizzazz, and Cathe’s tenacity for getting noticed. In Just Something I Made style, here is an instructional blog on how to create such success! Her ideas are unique, although she works to use materials that people can easily find. “Most of my supplies can be ordered on-line or found in a standard craft store. 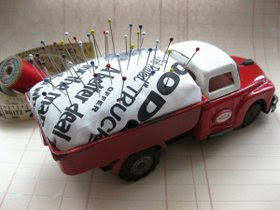 I try not to use one of a kind items, that are too unique, so my readers can easily replicate the craft in their own homes or studios.” This vintage truck pin cushion is just one great example! Cathe’s crafting ideas are complete with step by step photos, and links to sources for materials. For a post on how to make window signs, Cathe breaks down the project into four easy steps, using seven photos to prevent reader missteps. Cathe points readers to refuse centers to find old windows – saving more items from the landfill while giving readers ideas for using authentically vintage supplies. 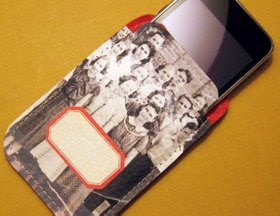 Did Steve Jobs get a load of the rockin’ leather Ipod cover Cathe Holden featured last month? Like it? Cathe’s got the instructions all laid out for you (of course) and she even made a free .pdf download of the vintage group photos should you decide you want to make one like it for yourself or a loved one! Cathe regularly provides readers with free downloads – offering immediate crafter gratification. Top that off with her frequent product giveaways, and you can see why readers check her site daily! Cathe puts her heart into creating great content for her site. Thousands of followers are puddin’ proof that she’s on to something with focusing on creating interesting crafting instructionals and commentaries. Her followers give her motivation to keep posting, and that's all she needs! Martha’s throne? All this effort to build good content may one day help Cathe establish the “Cathe Holden” or “Just Something I Made” brand in a profit making setting. Her youngest is 12, so that gives her the next 6 years to solidify her brand and reputation. She may well be the next Queen of Crafting, with her original ideas that ooze sass and pizzazz. 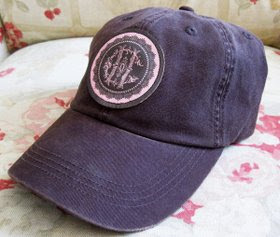 Who would have thought of taking their logo and creating an iron on leather patch to spice up a plain baseball cap? By paying attention to her readers and their interests, Cathe’s learned by hook and crook how to keep her site and posts fresh in reader’s minds. Cathe participates in Etsy’s forum and regularly posts under the “Techniques and Materials” category. Fellow crafters read her ideas and find their way back to her blog for further ideas. Features in hot crafting publications like Craftzine.com’s recent article on Cathe’s crafting space also point readers to Just Something I Made. Her graphic skills also come in handy when she needs to keep readers interested in her articles. 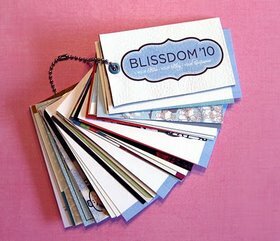 Check out the “2009 Gift Making Guide” mosaic post she made with 42 photos and links to the craft projects (e.g. this fabulous corduroy and rice heating pad) she featured throughout the year. Next week, Cathe’s off to Blissdom– a nationwide blogging conference. 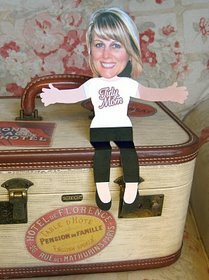 She’s bringing along her fellow blogger as a flat friend and toting one of her latest JSIM creations to hold the business cards of those she meets…. Will Blissdom bloggers know what hit ‘em when they meet this sassy, crafty Petaluma entrepreneur? Stay tuned by visiting Just Something I Made! Oh, King Winter... is Spring really so far away? Winter's Solstice blew in with a chill on December 21, and so the calendar says we have not even yet met the middle of your icy season. A month ago, I saw your bold, branches bared, and woke to the world painted white on freezing mornings. However, today I see you dancing towards Spring. The Magnolias have fuzzy-peach skinned buds, and the daffodil stems are pushing aside the woodchips near my front porch. My heart quickens with the thought of all that springs in the upcoming season, but is it not our task to enjoy each day as it rises before us? Be with each season and fully appreciate all of a season's gifts before it moves on? A family can embrace the four, rotating seasons by making a sacred place in our homes that mimics and acknowledges nature's dance outside our doors. Monica Ashley and her daughters pulled out King Winter's serene rendering (above) and drew inspiration for creating a winter scene on their mantle (below). Purple and ivory silks match the pale colors of winter skies at dawn or sunset... Sharp, faceted crystals stand in for ice... Curly willow symbolizes the leafless branches of decidous trees in hibernation... Wooley gnomes and mushrooms capture the sense of joy, magic, and whimsy of the sparkley snowflake season. With a little thought, I do suppose we could find many things to symbolize this season, and much to appreciate about a time that at first glance seem harsh and barren. Winter is unique and wonderful. I am enchanted by warm fires and wool blankets on cold nights. I do love the Winter holidays of Solstice, Advent, Christmas, New Year's, Ephinany, Lunar New Year, and all the other cultural celebrations that come during this time. Each of these holidays provides a wonderful occassion for feasting with family and friends. I also enjoy getting lost in the study of small snowflakes or frost formations on our plants and stones. When days of rain end, I do love to wander the garden and marvel at how fresh and clean the weather has left our happy places. King Winter, you must be very insightful to have claimed this season for your kingdom! Monica and her daughters behold your wisdom and call you to reign over their table as well. With mastery of wool and needle, Monica called your face into being. Her girls now wear your puppet's gown on their hands, weaving tales of your great wintry adventures. "I’ve never worked so hard for so little money!” declares Michael. “But we sleep well at night” adds wife Jill. Michael Leras bought five acres twelve years ago, preserving one of the last remaining ranches in a sea of new subdivisions popping up in Northwest Santa Rosa. Scratching a former career as a rodeo cowboy, photographer and model, Michael began life as a farmer when he first became a father six years ago. “We wanted to do something where we could work close to home while we raise our children” says Leras. Together the family (and farm hand Lindsay) care for more than 80 chickens, two Jersey cows, an orchard, and a vegetable plot. They create an abundance of farm fresh, organic foods - enough to sustain their own needs and to share with local community members. While farming as a family, Cruz and brother Whiley get an outstanding, hands on education as well as lasting health benefits. 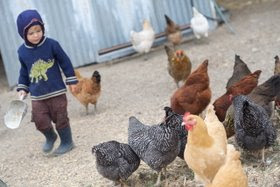 A study (2001 Lancet) reveals that exposure to farming in early life is linked to improved health including lower asthma rates. The children’s healthy skin and full faces also reflect the signs of strong health Dr. Weston Price would predict for children raised on whole, unprocessed foods such as the farm’s raw milk. Today, Leras puts most of his efforts into supporting his family cows’ milk production. Animal husbandry has a huge draw for this family, who enjoy caring for the animals and handcrafting milk products like cheese, butter, and whey. Buttercup and Dasi live like “grandpa’s” family cow – they graze in an open pasture, come into a metal barn (which Michael constructed from salvaged materials) for twice daily milking, and descend from a long-standing heritage breed that produces high quality milk. Leras and family attest that Buttercup and Dasi’s milk is fantastically delicious and nutrient rich. Unlike their conventional Holstein counterparts, these Jersey’s produce A2 milk with a high cream content. So good and rich is their Jersey milk, they feel inclined to share their creamy bounty through a cow share program. More Nutrition. Dr. Tom Cowan, Weston Price Foundation, Sally Fallon (author of Nourishing Traditions), Professor Keith Woodfard (author of Devil in the Milk), and a host of others offer convincing evidence that raw milk is digested more easily and contains more nutrients than processed milk. Of high concern to these health advocates are the proteins A1 and A2 beta-casein. Conventional cow breeds create A1 milk, which is under investigation for possible links to diabetes, heart disease, and even autism. Recent research seems to support what the Leras family knows from experience – food produced locally, under natural-like conditions, from healthy, heritage animals, and served in its raw form is richly nutritious. Better for Farmers. According to Weston A. 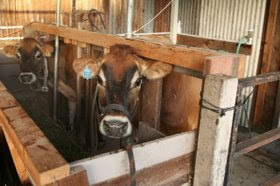 Price Foundation, raw milk sold directly to the customer garners a significant increase over conventional milk prices. 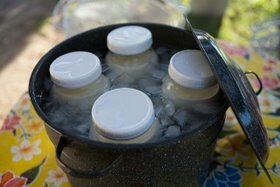 In fact, a recent New York Time article demonstrates “Raw Milk Sales Could Reinvigorate U.S. Dairy Farms.” Conventional farmers often struggle to break even. However, a farmer can simplify efforts and generate substantial profits by raising cows in open pastures for raw milk. Also minimalized are greenhouse gases. The Leras family takes these profits and shop locally – demonstrating the multiplier effect (read more in Sally Fallon’s report) of how raw milk farm profits benefit the whole community. Other local farmers with young families (e.g. 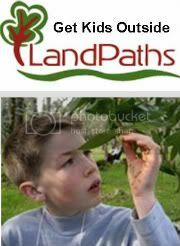 Singing Frogs Farm and many Farm Trails members) support the Leras’ ideal that old-fashioned, organic, community farming is a profitable and growing niche market. Cow Share. The Leras family offers community members part ownership of Dasi and Buttercup and their weekly milk production. Cow Share owners pick up their weekly share of pristine, A2, organic, raw milk (between a half gallon – gallon). The Leras believe they are one of three farms in California offering this product, and Sonoma County families are lining up to get their share of this healthy milk and a small piece of the slow-living, farm lifestyle. Imagine this Healthy Life! Visualize rising in the morning and walking out your backdoor to work. You sit down on an old wooden stool under a towering Eucalyptus, and chat with your family cow as together you produce a bucket of fresh milk. You scoop off some thick cream to add to your coffee and enjoy a sip. While you relax, you watch a line of cars forming the local morning rush on the busy road bordering your farm. Soon, the kids will also rise to gather eggs, and you’ll sit down to eat a farm fresh breakfast. This is the slow life Michael and Jill Leras choose and find deeply fulfilling. Take part by tipping back your own tall glass of old-fashioned, pure milk! 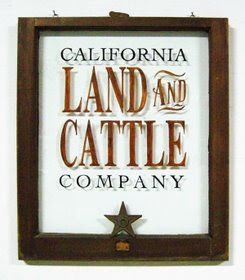 Ask the Leras Family or your local farmer if he has a cow share for you, or find your local raw milk retail store here. Not long ago, Isla used her dining room table as her headquarters for crafting her brightly colored wool “modern felt accessories” – swinging purses, hair bobbles and more. Today Isla runs a profitable business from a studio her husband constructed off their garden. (Read more about this inspiring and witty Scottish woman in Sono-Ma’s "Homespun: Weaving Family, Creativity, and Career into One Rich Life." To read more find this article posted on Sono-ma Authoress Holly's new San Francisco Examiner Page: Sonoma County Parenting Examiner. Today was not quite that kind of day... However, we did exercise, eat, and get outdoors albiet in a somewhat unconvential way. Bryles was up early this morning - ready to rock and roll by 4:45 am. He rifled through my old CD collection, and landed on "the pretty rainbow" CD - U2's Discotheque . The thumping music got him jumping, and he asked me to "dance around" with him. Who needs yoga when you can work up a sweat spinning to a soundtrack that hasn't been played since your high school days? The paper delivery guy did not deliver our paper as early as we found our way to the breakfast table, leaving me to drink my coffee with only half of the elements of my normal morning ritual. With no news stories to steal my focus, Bryles decided I was free to be his playmate. He again called me to the living room floor to make a dozer out of the couch cushions and living room table. He reveled in my attention, and I realized how much Christmas crafting consumed me during the past few months. Bryles needed that mommy time! I finally tore myself away to make the beds. Bryles happily played "mouse house" by hiding under the blankets and pillows, but stopped me in my tracks when I tried to make his new doll's bed. "I make Kris' bed!" he exclaimed. Oh my OCD, as I watched him try, unsuccessfully, to straighten the little sheets. Still, I want him to learn these lessons of caring for others and housekeeping, so I forced myself to stand back. I watched as he tucked and plumped the bedding, then carefully arranged Kris' little shoes under the bed frame. Suddenly interested in the doll I spent almost a year crafting for him, he asked me to help get Kris dressed. I watched as Bryles instructed Kris to "keep his arms down" as he slid the overalls on his shoulders, and again stood in awe of the intense level of detail that children mimic. He is learning so much at just three years old. Bryles donned Kris in a wool hat, sweater, and elf boots all made for him as baby gifts, but now reconfigured for a new life as Kris' garments. Dressing this doll became both a trip down memory lane and a glance at the future young man my boy is becoming. With Kris dressed warmly, I decided to suggest to Bryles that we all put on warm clothes and get outside. We haven't been sticking to our daily goal of getting outdoors, and I knew this would be a hard sale. Confession? I lured him out the front door with a smushed fruit roll, but I got us both out there! Scissors in hand, we took a walk through our garden with plans to snip off some of the frost damaged tips of our plants. Bryles loves to use scissors, and the important job of plant care kept him rapt for a time. Then he found sour grass and began tasting the different clumps springing up in our flower beds. I weeded for a bit, allowing the wintry garden to dictate our focus. Suddenly Bryles cried out "Lichen, Mommy!" With a bundle of bark, moss, and lichen in hand, he stood in awe. Yes! Back to our Monday wool theme. I've had it in mind to begin collecting lichen to dye a batch of wool. My tiny apprentice side kick is proving he's been learning well under the wing of our fiber teacher and her wild crafted dyes. We both bent to the ground to look for more greens, when we discovered we were surrounded by tiny little mushroom stools. Such lovely, delicate, hidden treasures - we needed to get the camera to share. We spent the rest of the morning playing "I Spy" in the Winter Garden delighting in all the signs of life emerging from the decay of fallen leaves, broken branches, and moist soil. Take a moment to see the photo story of what we discovered. You might even be inspired to get the outdoors back in your routine too! Inspired to hunt for your own edible mushrooms? Check out the Sonoma Garden's recent article on mushroom hunting on the Sonoma Coast! Want to buy locally grown mushrooms? 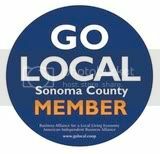 Hit the Santa Rosa's Farmers market!